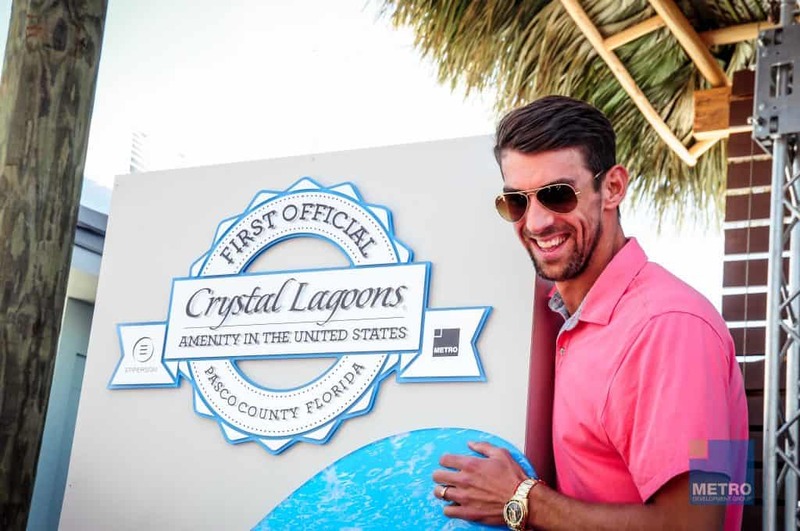 Michael Phelps made a splash at the Grand Opening of the nation’s first Crystal Lagoons® amenity in the Wesley Chapel Community, Epperson. The world’s most famous swimmer attended the tropical-themed event to speak to guests, sign autographs and meet fans. “For me, it is a true honor to be partnered with Crystal Lagoons and to give the U.S. their first Crystal Lagoon,” Phelps said to guests at the Grand Opening event. “There are so many activities, that’s . . . important to me now being a dad with two kids, so I’m excited you guys get to experience this,” Phelps continued. The Grand Opening event saw a successful turnout of hundreds of Epperson residents, friends, family and guests to enjoy and preview the highly anticipated Crystal Lagoon® amenity at Epperson. Join the waitlist for the most up-to-date information on The Lagoon opening here!